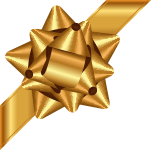 Premium, Upscale & Highly Scented Accompanied by a silver snuffer in a beautiful gift box. Lilac is a Beautiful Scent, with pleasurable notes of Lilac Green, floral notes of Lily of the Valley, Seringa, and White Peony and soft notes of Ylang and May Blossom. 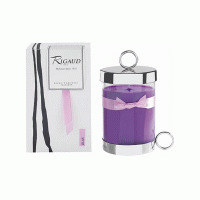 Singleflower fragrances focus on a single flower whose fragrance stirs strong emotions, such as rose, jasmine, or lilac. These fragrances have a great olfactory richness; the flower is stylized and may be enriched with touches of green, fruit, or even powder for greater modernity. 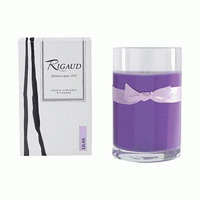 RIGAUD is the environmental fragrance par excellence, known worldwide and appreciated by connoisseurs such as the Prince of Wales, Julia Roberts, Liz Taylor, Elton John, Donnatella Versace, Aaron Spelling, Carly Simon, Julie Andrews, and the late Frank Sinatra. The White House became a place filled with the wonderful Rigaud Cyprus candle, as Jacqueline Bouvier Kennedy brought them into the world of JFK.